We started our hand made gift business 2.5 years ago, and bought our land 8 months ago. Since doing both of these we have been running wide open. Maria and I both work full time jobs besides the other activities. She works 40 hours a week at her “normal” job. Then she comes home and takes care of me and the house. (A full time job in itself, and I’m really trying to up my game so it doesn’t all fall on her shoulders). Then she sews, tiedyes, and answers customers questions. On weekends that I don’t work, we go to the farm to continue improving and clearing the land. I work a really screwy schedule. I work 15 days a month, with 12+ hour, very stressful shifts. Those days are spread out throughout the month with 3 day weekends every other week. When I’m not “at work” I’m in the forge, making knives and other metal items in 130 degree heat. Then on those 3 day weekends, to the farm to pull stumps and clear land. Oh yeah, during all of that, I’m answering customer’s questions and taking custom orders. This weekend was one that we were to go to the farm, but we didn’t make it. Thursday was my last night of work. Normally I’d be in bed by 530 am, and then back up around 11 to work Friday afternoon in the forge. Then I would take off Saturday morning for the farm, stay overnight, and work both days before coming back to get ready for work on Monday night. This past Friday, I worked in the forge like normal. By the end of the day I was exhausted. This schedule has been going on for months and I think I hit a wall. I told Maria that I didn’t think I was going to make it to the farm this weekend. I went to bed Friday night and slept just over 14 hours. I had the intent to just relax this weekend and recharge my batteries. It didn’t work very well. I don’t just sit around too well. I ended up going through my knife stock and realized that I was way behind on making sheaths. So I spent several hours making 15 leather sheaths. I was able to do that part in the house, but I also ended up with 3 orders for woodworking holdfasts, so there still ended up being some forge time this weekend. Those are all the sheaths I made this weekend. Maria let me use her cute little railroad rail anvil I had made for her to set grommets with. As I was busy breaking the plow yesterday I kept feeling as if we just aren’t catching up, at all.. But I was just looking at the photos I took today and comparing them to earlier in the spring…wow! There actually IS some progress. 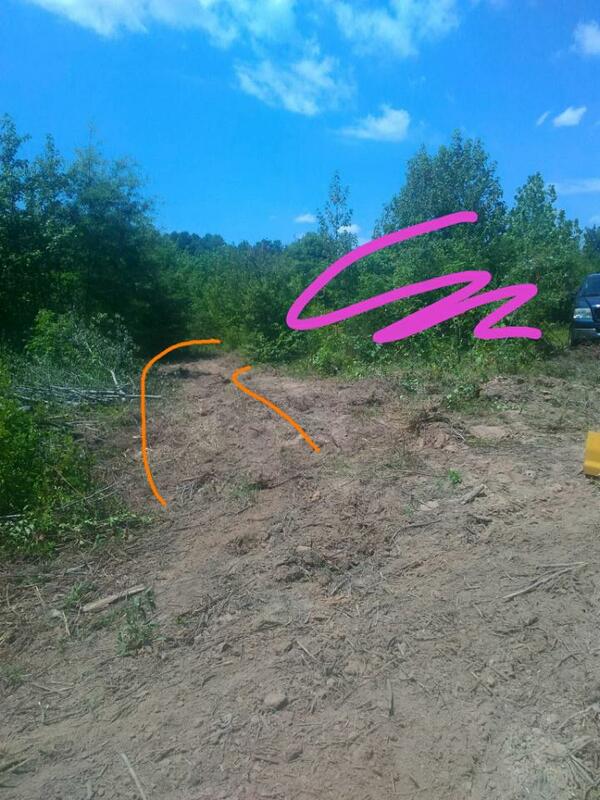 The orange is the area that is becoming the last 300 feet of driveway, the pink is what needs to go. We’ve only cleared a small portion of the pink shaded area. The above photo is from earlier in the spring. When I could barely even get the tractor back there. This was this past Saturday, just prior to breaking the plow. Better, but not great. And now, that’s where we are at. 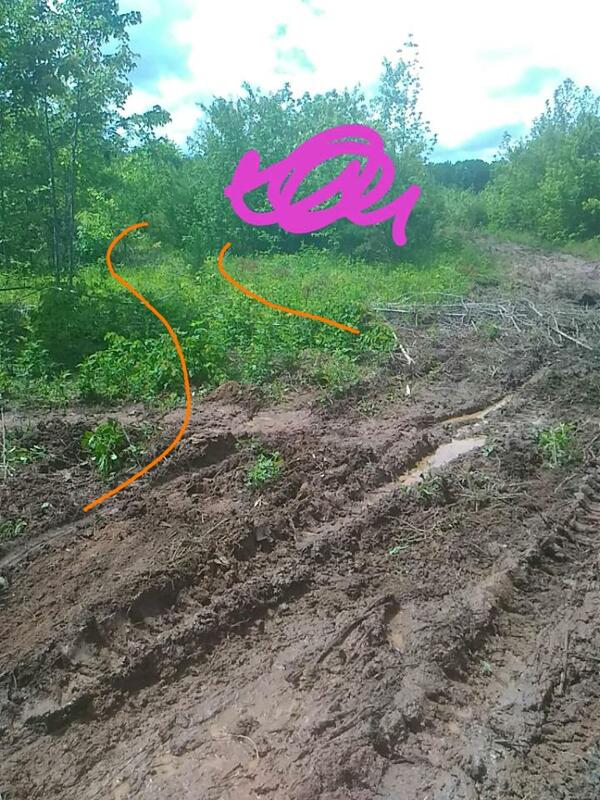 Still not great, or done but we can get both the 4 wheel drive AND the 2 wheel drive trucks back to the campsite. And able to get the pop up camper on site as well. So…when you keep looking at things too close you miss the beauty of the progress. Instead of missing the forest for the trees, I missed the driveway for the dirt. 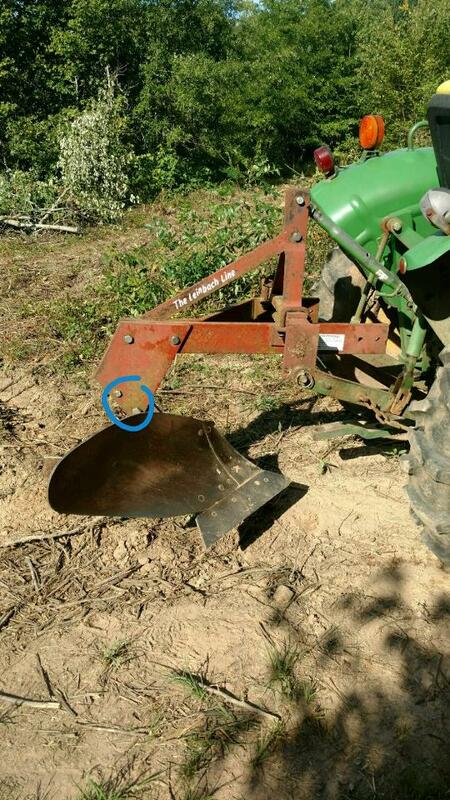 By the way, the repaired plow..
That top bolt in the blue circle is the one designed to shear. 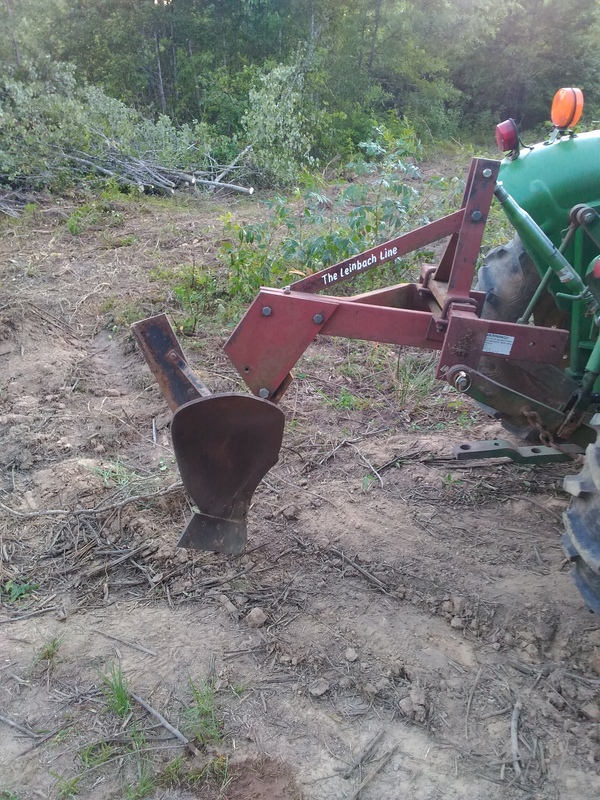 The good news is that I always have plenty of those bolts on hand since they are the same ones that protect our bush hog pto shaft from exploding when you whack the crap out of a stump (which I am also REALLY good at doing,lol). I’ve got quite a bit of experience with equipment, and living in the woods. Building a homestead from scratch is all new to me. I think my lesson learned this weekend was that on the homestead ( and in life) things might not look like they areyou moving along, but if you step back to look you might just be surprised. Maria and I hope that you all have a wonderful week. Meeting neighbors and breaking plows..
Ok, not exactly neighbors, but the nice folks in our new community. If you’ve followed our blog for any amount of time you’ll know that Maria and I are going to be unable to live full time at the farm for a couple of years. I’ve got to finish up and retire from that silly job/ career. That will gives us a decent monthly income to help fund things a little. And, while I would love to be here now, all the time, it is still going to take a couple of years to get the house, barn, and shed built so we can live here. So, on to the neighbors. Awhile back we met our actual neighbor that lives a cross the road. He’s a great older gentleman and his wife who have lived in their house since the 70s. But, as we drive out here every couple of weeks to work and improve the land, we drive through our “new” community. Keep in mind that the town is 10 miles away and at the time of the 2000 census there were 1257 inhabitants. Just our kind of place. For the last few months we’ve noticed on a sign in front of the Gretna volunteer fire department, they have been advertising a barbeque supper as part of there fund raising. Well, that was tonight. We worked on the farm all day and then washed up as best we could and went to town! It was really nice to see real hometown folks come out to support there volunteer firemen and meet with each other. The little old ladies with their hair and make up done and the little old men in their Sunday clothes. All meeting and greeting each other as if they hadn’t spoken in years. Just our kind of place. The only people that actually talked to us were the fireman we had spoken to earlier in the day when we stopped to buy raffle tickets for a 4wd atv that they were giving away. But even in the hub bub of their big shindig, those guys remembered who we were and greeted us as friends. Just our kind of place. So that was the wonderful part of the day. Work at the farm was good. Not too hot, and productive, until…. If you aren’t familiar with a single row, leinbach plow, they aren’t supposed to look like that. They have one bolt in the frame that is weaker than the rest. Its designed that way for safety. Should you over tax the plow i.e. Hitting a big rock, stump, or just generally beat the tar out of it, that “shear bolt” is meant to do just that, shear. This allows the blade to rotate down and release you from whatever it was that you didn’t need to be plowing. Maria and I had to redirect about a third of our driveway (300 feet of it) because our original path had a couple of really sharp turns. And, we started clearing the first 2 acres that will be the “barnyard”. 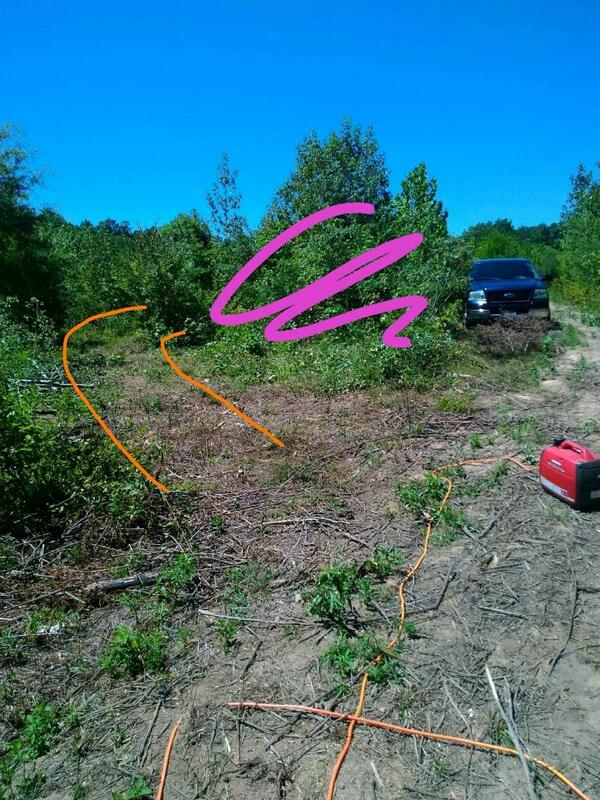 We got brush cut and stacked, trees felled and stacked, and then I went to town…see that connection from above? I ripped and tore my way through that dry clay soil and got about 80 percent of the stumps ripped out. Our little, 32 year old John Deere 850 was grunting and groaning, but she was getting the job done. Then I snapped the bolt. That was a perfect time to park her, get cleaned up and go meet our new community. Either in town, or 10 miles away here in the brush…its just our kind of place. This is weekend long work trip, so hopefully I’ll have some really cool photos tomorrow. 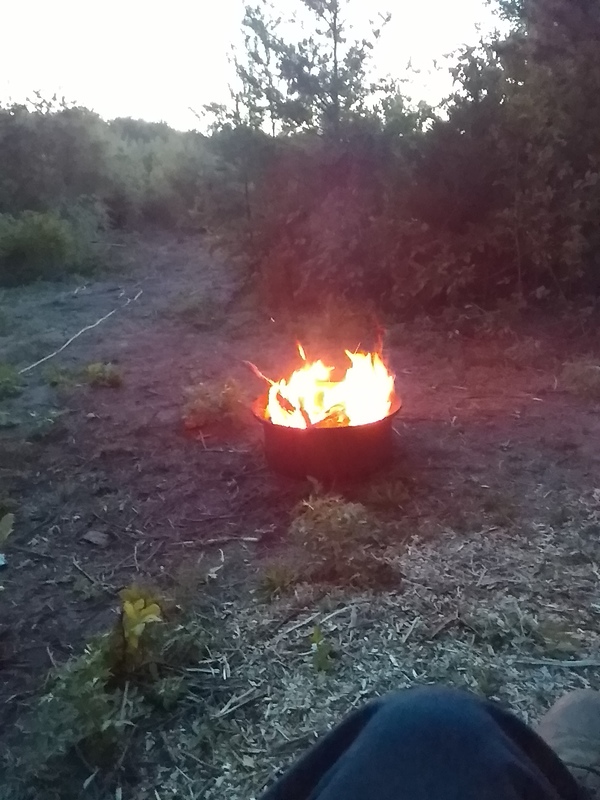 But now its time to relax by the fire and listen to the whipporwills sing in the distance. We hope that you are all having as good of a weekend as we are!